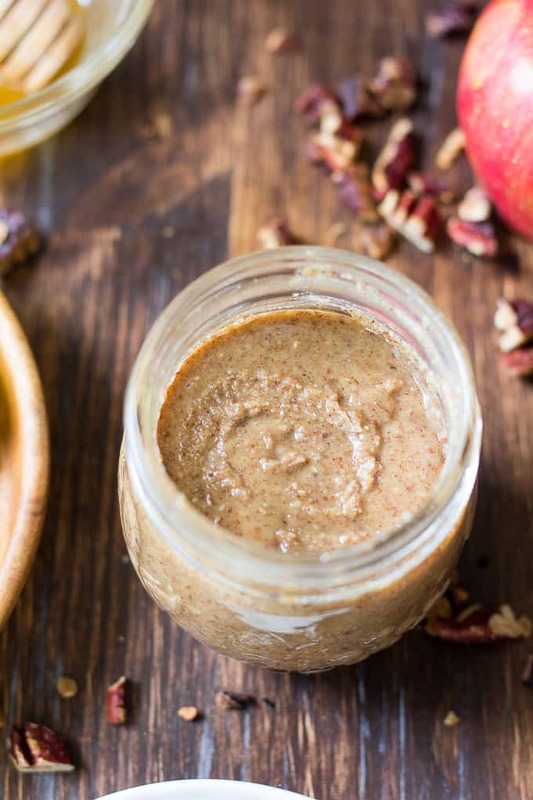 Easy, homemade, Honey Roasted Pecan Butter made in minutes in a blender or food processor! Rich and creamy with the perfect amount of sweetness from raw honey. 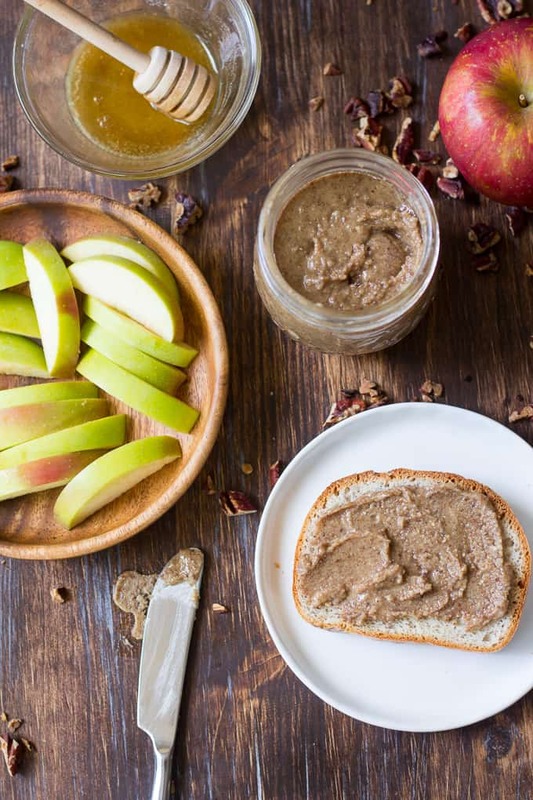 Great to spread on toast, as a dip for fruit and veggies and to use in desserts! Paleo & refined sugar free. 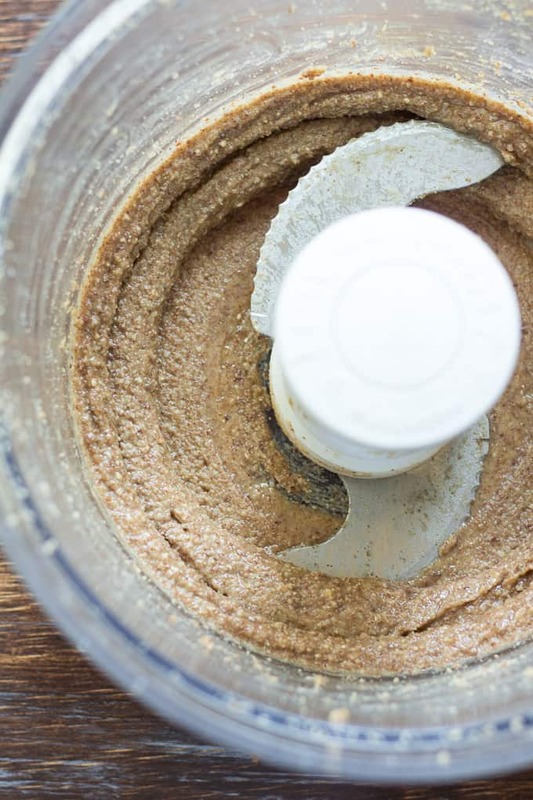 First things first – this was my first time making any sort of homemade nut butter. 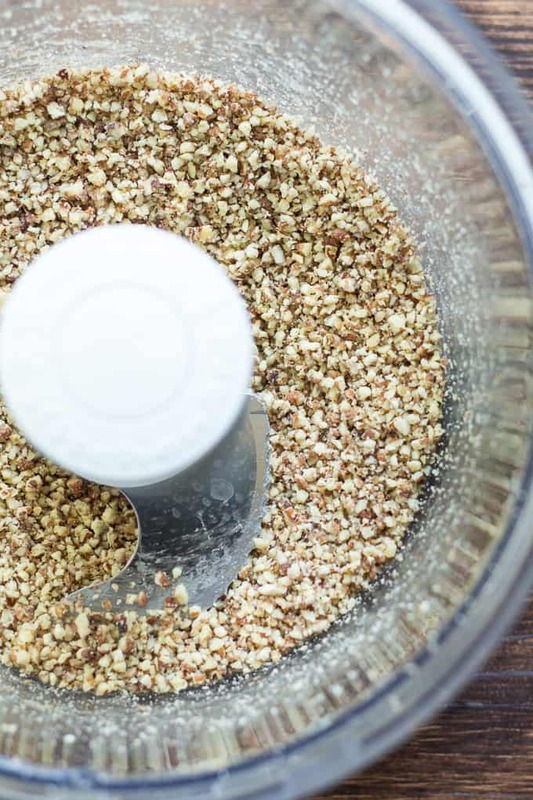 I know – I’m way late to the make-your-own nut butter party. Unless you count that time when I was about 5 and tried to make peanut butter on the kitchen floor with peanuts, aluminum foil, and a hammer. I managed to keep my fingers, but, the peanut butter really sucked, as you might imagine. I never got past the whole crumbly-nut stage of the “processing.” I asked my mom what went wrong, and, she told me I probably needed more ingredients and a machine of some sort. Doesn’t the fact that I remember this TRUE STORY from 29 years ago basically mean I was meant to be a food blogger? I tried to make peanut butter with a hammer for fun. I also tried to make pretzels with Wonderbread, salt, and a toaster oven, so I’m not bragging about my culinary genius here. Just interesting that these are my childhood memories. Anyway, it turns out my mom was half right – I didn’t technically need any other ingredients, but I did need a machine, since the hammer wasn’t doing it. 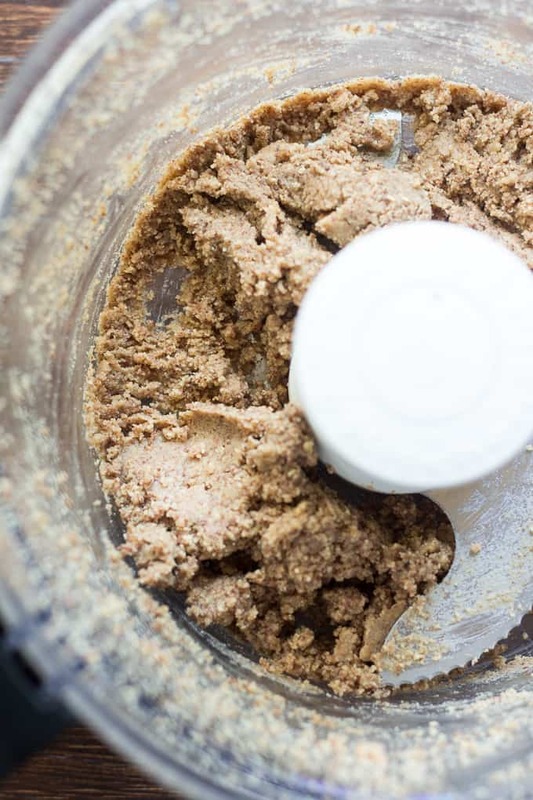 When she bought me this food processor at least 25 years after the peanut-hammering incident, I bet she wasn’t thinking that I’d finally get to fulfill my lifelong fantasy of making my own nut butter. Little did she know! Even still, I might have been mildly traumatized by the whole thing, because for some reason, I had it in my head that making nut butter was hard. I guess you can consider that my first “recipe fail” and, boy, it haunted me 😉 I mean, I will make my own dairy-free caramel, bake a loaf of bread 4 times until it’s “just right”, and even make my own mayo. But turning nuts into butter? I don’t know…sounds tricky 😉 In the interest of moving on and overcoming ridiculous mental/recipe blocks, I decided to make this pecan butter. Whoa! 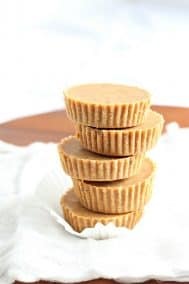 I have to say – this was easy (with the food processor of course) and absolutely delicious – better than any store bought pecan butter that I’ve had, and, less $$$ of course. As you can see from the photos above, there are a few “stages” to this pecan butter making. Depending on your processor or blender, it might take more or less time than mine did. But, do not despair! It WILL happen and it will be AMAZING. 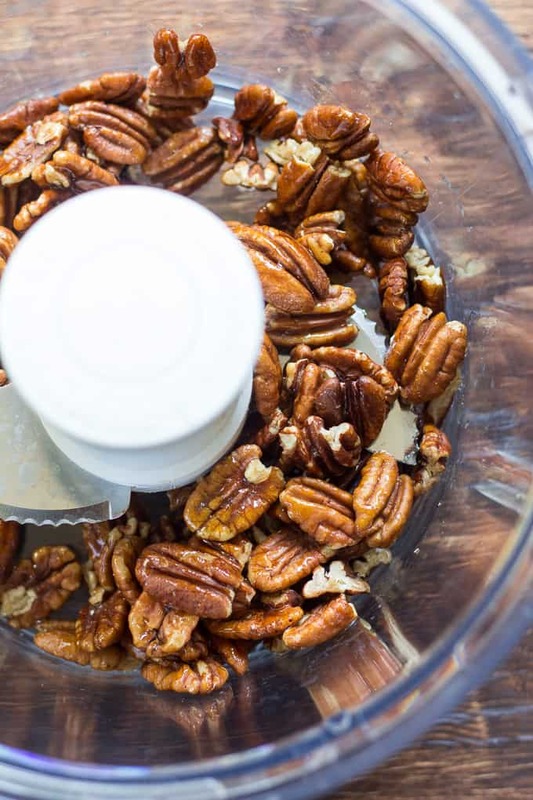 I recommend stopping to scrape the bowl several times to make sure all the pecans blend together well. The rest is all really done for you – no upper body work required. Unless you count cleaning out the food processor – admittedly it’s not the most fun thing to do, but, that’s why we make sure we have dishwasher that actually washes dishes. The best part, is, once it’s done you can use it for everything, AND it lasts 2 weeks in the refrigerator! Not that it will remain there that long, since it’s dangerously addicting. But, this is significant for me, because to be honest, one of the things that stops me from making my own dips is that they just don’t last long enough. As much as I love them, I CAN’T STAND waste! 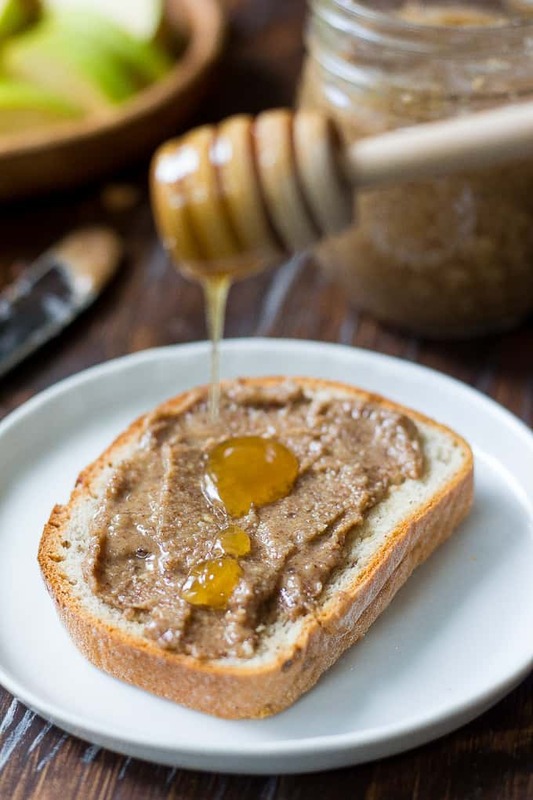 No worries at all with your honey roasted pecan butter – it won’t go to waste, PLUS you can even double the recipe if you need to feed a lot of pecan-hungry people. Let’s go! 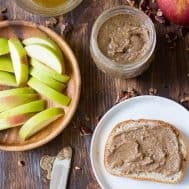 Easy Homemade Honey Roasted Pecan Butter that comes together in minutes with a food processor or high speed blender. Paleo, Refined sugar free, healthy, fun to make and just 4 simple ingredients! Preheat your oven to 300 degrees and line a baking sheet with parchment paper. In a bowl, melt the honey and toss with the pecans to evenly coat. 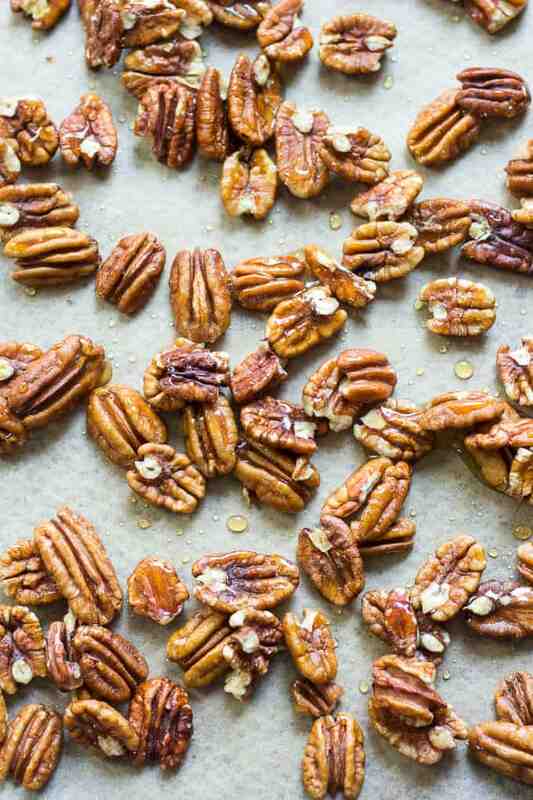 Spread the pecans out on the baking sheet in a single layer and roast in the preheated oven for 10 minutes. Remove promptly to avoid burning. Process on high speed for a few minutes until a paste begins to form. Stop, scrape the sides of the bowl, and continue to process for another 5 minutes or so, stopping again once to scrape the bowl. Once a creamy butter forms, add the vanilla and salt and process just to combine. Done! Transfer all the honey roasted pecan butter to a glass jar with a lid, and enjoy! Store covered in the refrigerator. 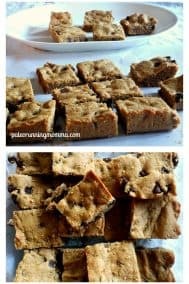 **This recipe can easily be doubled to make a larger batch! Want more healthy, simple homemade dips and spreads? Try one of these! 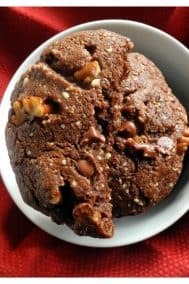 What was your first “recipe fail”? Did you wonder how to make your favorite foods when you were little? I honestly can’t remember my first recipe fail, although I have a feeling it was something to do with pancakes… which would probably explain why I still hate flipping them 😛 And I’ve only made my own nut butter once and decided it was way too loud and stressful for me. Although I do love being able to flavour them any way I want! Flipping pancakes is definitely stressful! I’ve had plenty of pancake fails over the years, ugh.